I'm new here and I would like to share with you people my parrot. Her name is Bibet and she is one smart and talkative bird. I would like to train her to do some tricks and stuff but I don't know how to. 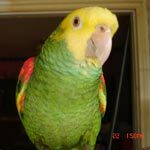 Can someone suggest me some ideas about the proper training for parrots? Welcome. There are many members who can help. Read up on training in the training section. I don't train. My kids learn like kids. I would like to teach them how to stay out of trouble. If you find out please let me know. Welcome Bibet and parrot lover (we have something in common ). Yes, please tell us what species of parrot you have and the age as well as what you would like to do with it so we can help you with some pointers. Mine is a small cockatoos parrot and she has a nasty temperament sometimes. She loves eating fresh fruits and veggies. I would like to interact with her more, but she just really doesn't like playing much. I gave her toys that she can shred to keep her from getting bored in her cage. I would like her to learn some tricks like mimicking human voice or whistles. I heard that they can develop screaming issues so I really want to train her to have an acceptable behavior. Ignore the bad and reward the good. Just like children, the more you talk to them using the same words for the same thing the faster they learn to talk. Myrtle is 7 and I have had her for 6 years. From day one I have tried to get her to say "hey baby, what's up". They both now say "hey baby" and "what's up" but refuse to do it the way I want. My aunt is very demanding and when she does not want to discuss something she blows me off with "oh well". Now when she is trying to tell Myrtle something Myrtle will say "oh well" and fly away. Be careful. You never know what words they are going to like and repeat. I don't know how Rainbow learned so much. He was 15 when I got him and took my house by storm. He is 32 now and only talks when he has something to say but he still has a lot to say. Well, let me tell you that if you keep her in the cage for too many hours, she will scream no matter how many toys you put in there because cockatoos (do you have one with a yellow crest? as the one on the little drawing you put on your posting?) need to be with their humans (and that means you either touching the bird, the bird perching ON you or you directly interacting with it) and, if they don't get what they need, they scream (and some of them barber and/or pluck their feathers and even self-mutilate). Unfortunately, you can't train a parrot 'not to have issues', there is no such thing. The only way to achieve a well-adjusted bird is to give them what they need and that means a strict solar schedule (or they get intensely hormonal and scream like maniacs all day long), a good fresh food diet (high protein also makes them hormonal), hours and hours of freedom to roam/fly around the house and hours and hours of company and/or interaction. Cockatoos are all very needy birds and the main reason why people give them up all the time is because they (the humans) cannot provide the right care for them. Now, as to talking... well, not all of them talk and, even the ones that do, would usually say one or two words and that's it. Being extremely consistent in the time of the day you address them and always using the same words and phrases helps a lot but a bird that did not learn to communicate in human language while young might never learn to 'speak human'. My birds all know the difference between 'Good morning' and 'Nite nite', and between 'Hello' and 'Byebye' and even the ones that do not talk understand a very large number of words, phrases and commands so although their talking is real cool, is not as if you and the bird cannot communicate adequately without it. liz wrote: Ignore the bad and reward the good. Just like children, the more you talk to them using the same words for the same thing the faster they learn to talk. I wish I could train them like that as well. Is it necessary to give treats frequently? I have tried teaching her some words, but until now I never heard her talk. Last edited by ILoveParrot on Tue Mar 21, 2017 12:58 am, edited 1 time in total. Pajarita wrote: Well, let me tell you that if you keep her in the cage for too many hours, she will scream no matter how many toys you put in there because cockatoos (do you have one with a yellow crest? as the one on the little drawing you put on your posting?) need to be with their humans (and that means you either touching the bird, the bird perching ON you or you directly interacting with it) and, if they don't get what they need, they scream (and some of them barber and/or pluck their feathers and even self-mutilate). Unfortunately, you can't train a parrot 'not to have issues', there is no such thing. The only way to achieve a well-adjusted bird is to give them what they need and that means a strict solar schedule (or they get intensely hormonal and scream like maniacs all day long), a good fresh food diet (high protein also makes them hormonal), hours and hours of freedom to roam/fly around the house and hours and hours of company and/or interaction. Cockatoos are all very needy birds and the main reason why people give them up all the time is because they (the humans) cannot provide the right care for them. Thanks for sharing that Pajarita. It's really good that you've got trained birds at home. Yes, my cockatoo has a yellow crest. I noticed that when she's not getting the attention she deserves, she begins to act out. We also noticed that longer training hours tend to make her lose interest. How long should I train my cockatoo?